Here are the new sets of FREE LET Reviewers with answer keys. The following reviewers are 100% free. You may check it bellow. 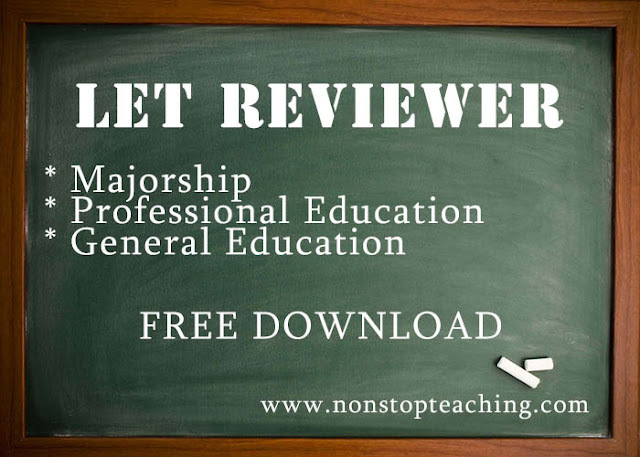 Here are the new sets of FREE LET Reviewers with answer keys. The following reviewers are 100% free. You may check it bellow. Available Reviewers: LET Reviewers for any Majorship with answer keys LET Reviewers for Professional Education with answer keys LET Reviewers for General Education with answer keys LET Reviewer for English Major with Answer Keys English 50 Items Part 1.docx Englsih 50 Items Part 2.docx LET Reviewer for Filipino Major with Answer Keys Filipino 50 Items.docx LET Reviewer for Mathematics Major with Answer Keys Mathematics 120 Items.docx Mathematics 170 Items.docx LET Reviewer for Science Major with Answer Keys General Science 30 Items.docx Biological Science 35 Items.docx Biological Science Compilations.docx Chemistry 45 Items.docx Earth Science 35 Items.docx Physics 40 Items.docx Social Science 50 Items Part 1.docx Social Science 50 Items Part 2.docx LET Reviewer for MAPEH Major with Answer Keys MAPeH 25 Items.docx LET Reviewer for Technology and Livelihood Education (TLE) Major with Answer Keys TLE Module.docx TLE 60 Items Part 1.docx TLE 25 Items Part 2.docx Professional Education Reviewers with Answer Keys ProfEd 50 Items Part 1.docx ProfEd 50 Items Part 2.docx ProfEd 100 Items Part 1.docx ProfEd 100 Items Part 2.docx ProfEd 150 Items.docx General Education Reviewer with Answer Keys GenEd 45 Items.docx GenEd 120 Items.docx GenEd 200 Items.docx For the complete list of LET Reviewers click the link below: Latest LET Reviewers Compilation with Answer Keys How to download? Please read this Simple Downloading Instruction Good Luck and God Bless Note: All files are safe and free from any malware or virus. Please read the disclaimer below. Thanks and Credits to the original author. Nasaan po yung for AP?